f you are like most New Yorkers, your enthusiasm for holiday tipping likely falls somewhere between attending the Rockefeller Christmas Tree lighting on crutches and dodging window gawkers at Macy’s Herald Square. After all, it’s something that you’re expected to do, during what is already one of the busiest and most expensive times of the year, but without clear guidelines—how maddening is that? To help you calibrate tips that are neither too small nor too large, we’ve updated our annual holiday tipping guide. Pour yourself a mug of cold brew, and settle in to review our recommendations and strategies for mastering NYC tipping season. Even if you think you already know what to tip—based on how much you’ve given in the past, for example—you may want to take a fresh look. Because many building staffers now also serve as de facto private distribution managers, handling your Seamless and Amazon Prime addictions on an unprecedented scale, how many packages you receive is becoming an increasingly important part of the tipping calculation. For an up-to-the-minute snapshot of what your neighbors are planning to tip this year, take our two-click annual tipping poll. No. 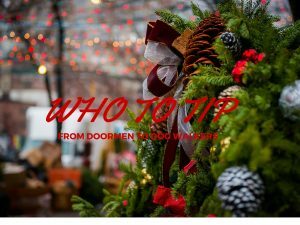 You’ll be in the minority if you don’t, but tipping the staff during the holidays is a custom, not a requirement. Many building staffers tell us they treat non-tippers the same as tippers, just as plenty of others admit to extending fewer favors and smiles to non-tippers, or subtly encouraging them to “pay as you go”—in other words, to tip for each extra service staffers perform. How much should I tip building staff? The precise amount depends on the size of your building (the larger the staff, the smaller the individual tips), quality of service, staff seniority, length of time you’ve lived there, whether you own or rent (more on that below), personal chemistry, your financial circumstances, and whether you’re frugal, generous, or somewhere in between. How much should I budget in total for the entire building staff? Much will depend on the size of your staff and the other factors cited above, but it may help to review the results of Brick Underground’s 2017 tipping poll, completed by more than 3,550 New Yorkers, to get a sense of what others do.